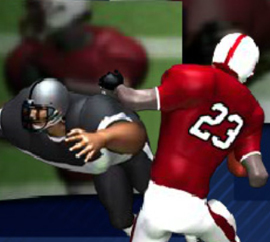 Become the famous football star you’ve always wanted to be in Linebacker 2! 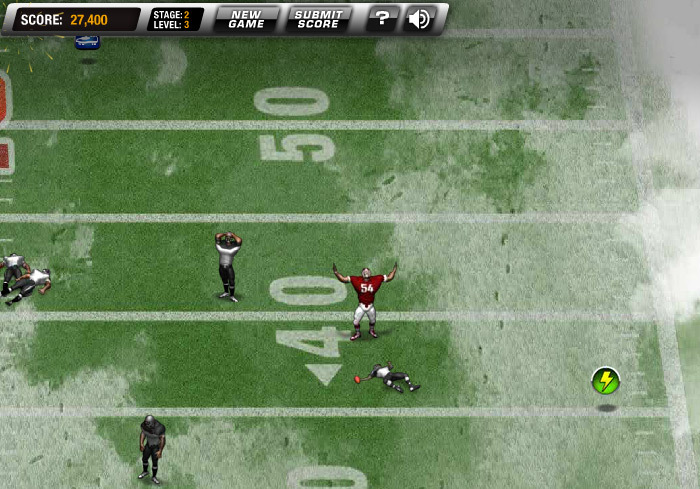 Fight off the toughest blockers and tackle the running back before he can say touchdown! 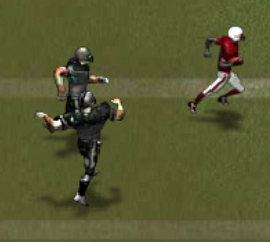 In Linebacker 2 you play as a famous football star, chasing down and tackling the opposing team’s running back before he has a chance to make the winning touchdown. 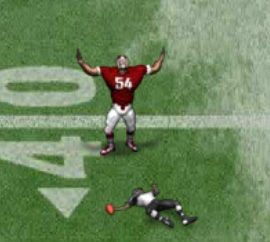 He has come fully prepared for you though, with a full team of blockers to help him reach the goal line. 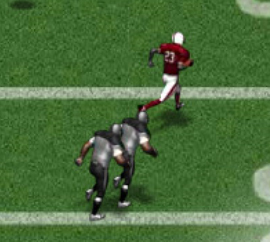 Avoid or plow through these blockers and stop that running back before he makes it into the end zone. If you fail to stop him, you will lose a defensive stand. When you lose a total of four defensive stands, you will lose the game. Don’t fret, though, luckily your stage progress is saved! 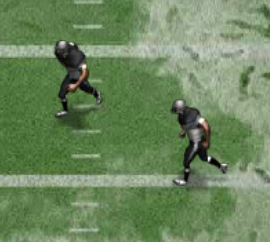 Similar to the previous version, in Linebacker 2 your default key controls are I, J, K, and L to move your linebacker in the direction you want him to go. 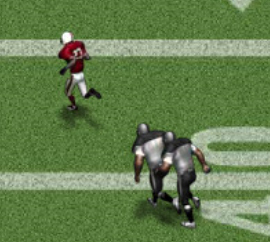 Using the spacebar while the game is in action will cause your player to dive tackle the running back. In addition to these default control settings, players also have the option to change the key controls in the control panel to W, A, S, and D for the directional controls. There are three different special moves that you can unlock throughout the game: Bull Rush, Throw Down, and Shuck. Each of these special moves unlock once you’ve completed a specific stage in the game. Bull Rush – Unlocks in stage 2. Press the A key to activate it once it is unlocked. Throw Down – Unlocks in stage 6. Press the S key to activate it once it is unlocked. Shuck – Unlocks in stage 9. Press the D key to activate it once it is unlocked. 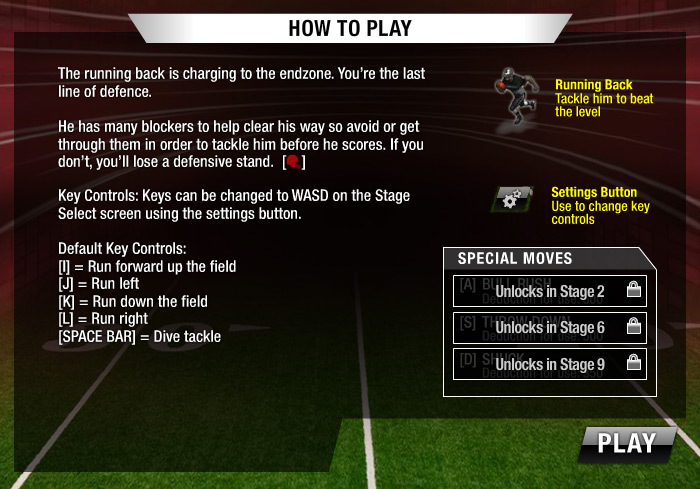 As in previous versions of Linebacker, as well as other games from the same developer, Linebacker 2 comes packed with 15 different stages for you to complete. In each stage, there are three or more levels you need to beat in order to unlock the next stage. In addition to unlocking future stages, by completing the stages and levels you will also unlock some awesome special moves for your player to use in order to advance to higher stages and obtain incredibly high scores! 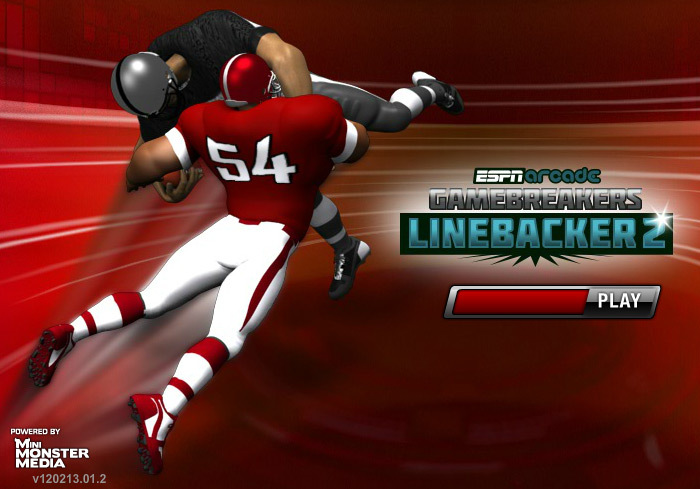 Linebacker 2 is an amazing game for avid football fans to enjoy during their spare time. However, many new gamers may find it a little difficult to play. If you find yourself stuck, try out some of these helpful tips to earn those high scores that will make your friends envy you! Keep your eye on the yellow arrow on your screen. 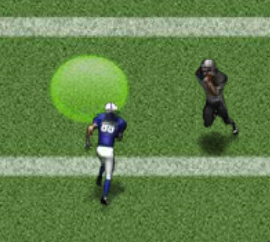 This will tell you the approximate location of the running back, and can tell you which direction to start running. 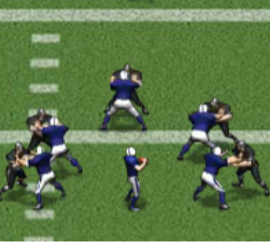 Watch out for those pesky blockers – there are many on the field! While you’re at it, watch out for the large mud puddles and other obstacles scattered throughout the field! 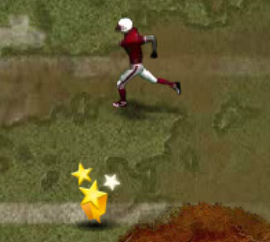 To gain some extra points, and give your football star an extra boost, try to collect as many power-ups as you can throughout the game. You can find them scattered all over the field. 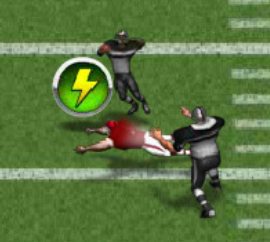 Some may look like a lightning bolt, which when collected, will give you a brief burst of energy, causing your linebacker to run faster than usual for a few seconds! If you get stopped by the blockers, try using your spacebar! Sometimes it will help you knock those annoying blockers on their butts faster so you can make your way to the running back!